All you need to hatch chicks in your care home! Welcome to the Care Home section of the website. Bringing back the ‘good old days’ when every family had chickens! We provide a resource CD with lots of resources for residents, including knitting, crocheting, stitching, recipes, puzzles, crafts and games (including “chick” bingo). This programme is becoming increasingly popular with Retirement, and Care Homes. 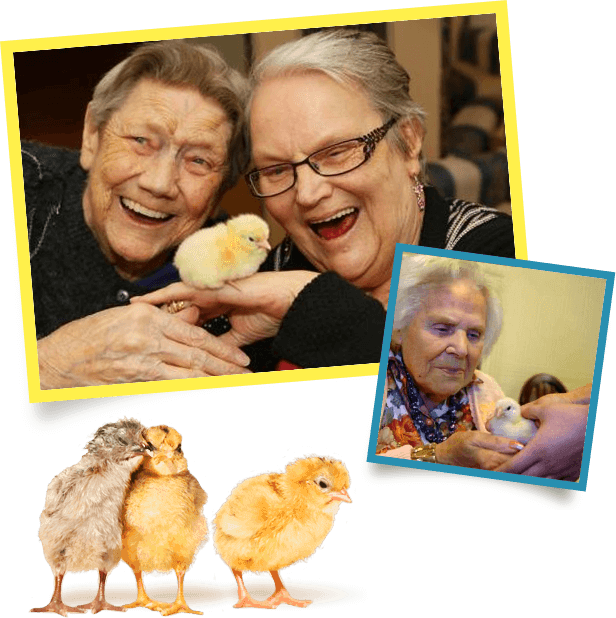 While providing a common interest for all residents and stimulating social interaction, memories come flooding back of the ‘good old days’ when every family had chickens in their gardens. Tales of collecting eggs, being chased by cockerels and trading for vegetables with their neighbours are exchanged. You might like to try some of our fundraising ideas.